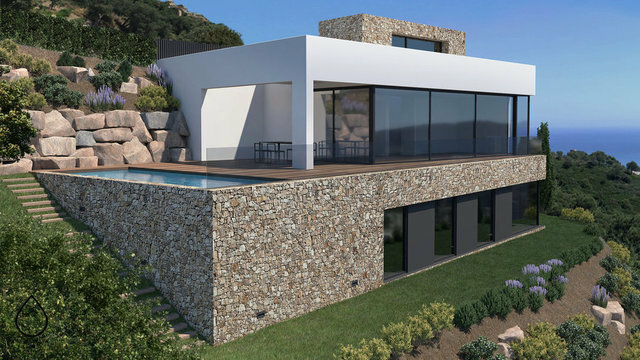 This future house is located in a residential area, between Sa Riera and the town of Begur. Laid out over three levels the property is built using the unevenness of the plot. The entrance is on the upper floor at the garage, then descending to the main floor, and below the bedrooms. On the main floor there is a spacious living room, a guest toilet and an open kitchen with access to the terrace and pool. The four bedrooms are located on the floor below the living room, all with access to the garden; two of them are en suite and the other two share a bathroom. Observations: Air conditioning/heating, heat treated pine terraces, swimming pool, double garage, fitted wardrobes, privacy, sea views, south facing. Construction begins under buyer's demand. Options to choose finishing’s. Consult us.